A section or sections of your menu not being added for printing. You may be trying to print a blank order. Go to the posBoss Settings area. Under the section Unallocated sections to print does it say “All sections Allocated” or are there sections unallocated as below? If there is a section or sections needing to be allocated select the required printer from the left hand panel then press Print Orders from Sections. Make sure all the sections you want to print are ticked. Press the section to add/remove a tick. Try reprinting the order again from Settings > History > Orders or test on a new order. If everything else is printing but sometimes your orders aren't, you may have printed a blank order. 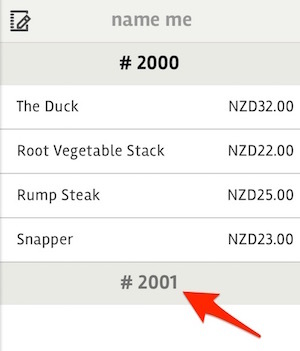 When you initially create an order, you have the option to Pay or to save it as a Tab. 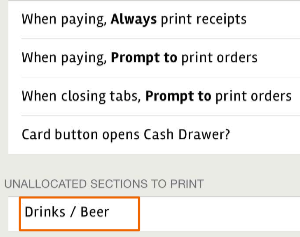 When either of these options is selected, you will be able to print the order. If you have gone to the pay screen or tab and selected not to print the order for any reason, then you return to the order screen, then try to reprint the order by pressing Pay or saving as a tab... the order will not print. This is because the original order is considered complete. You will notice that there is a new order number - in the case below - order 2001. When you go to print again, posBoss is attempting to print the second (blank) order. Try reprinting the order (2000 in this case) again from the Settings > History > Orders. Select the order and press Reprint at the bottom right.